Bar Harbor on the Horizon! I highly recommend the Shore Path (starts in town, level walking, approx 1 mile in length, out and back walk or you can come back via town) or Compass Harbor. Compass Harbor is just a short ways out of town and it offers varying terrain (though none very steep) with harbor views and the chance to see the remnants of the Dorr Mansion. 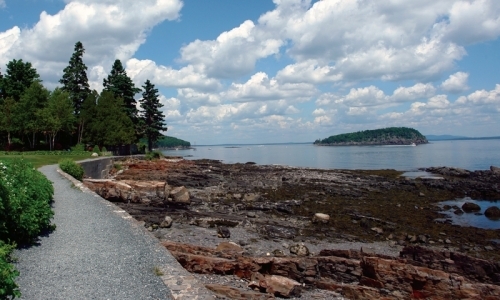 It’s one of the most picturesque walks on Mount Desert Island. If you head out of town on Main St., the entrance to this trail will be on your left after a half mile or so. The Chamber of Commerce (corner of Main and Cottage) should be able to give you a map to the trailhead. You can totally do both in a day, btw. As for lobster, my favorite is at Thurston’s in Bernard, but that’s kind of far away. If you’re looking for a good in-town lobster, I recommend Side Street Cafe. Their lobster roll is the best in Bar Harbor. I also really like the lobster roll at the Thirsty Whale, but Side St. has the best full lobster dinner in town. Can’t wait to try it out. Thanks Amy!